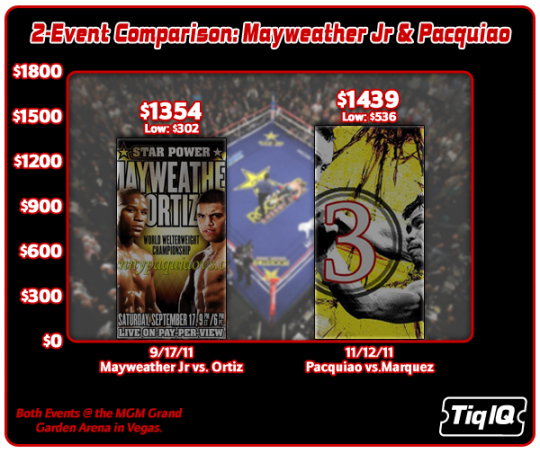 Manny Pacquiao’s numbers for the third Juan Manuel Marquez fight on November 12 exceeded those of the Mayweather’s return fight against Victor Ortiz, reaching according to reports, something around 1.4 million PPV buys, making Pacquiao, not Mayweather, the current PPV king. Well, Pacquiao doesn’t take same amount of money that Floyd does. His fights are a little bit less expensive (we won’t call this cheaper, that would be misleading), but bottom line, including the Mosley fight from May, he gets more buys than Mayweather. Slightly, but a 100k edge probably. Money? Pacquiao had $22 million guaranteed from the fight, probably rising to well over $30 after the PPV money is calculated. Mayweather took home more than $40 million for his fight with Victor Ortiz. 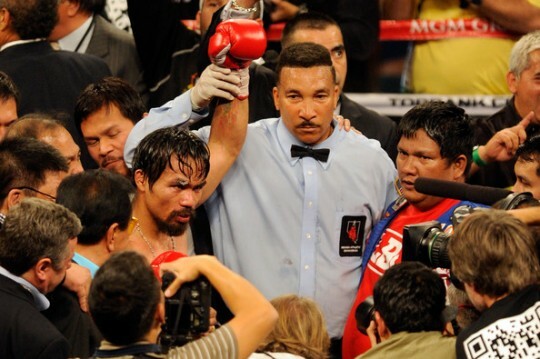 But the Pacquiao fight did enjoy another factor that Mayweather didn’t have this time around – Juan Manuel Marquez. According to Todd DuBoef from Top Rank – I don’t have the exact number, but I can tell you that it’s the best pay-per-view that Manny has had in his history. We are talking about a number that exceeds 1.3 million homes. We are hoping for it to be 1.4 million homes. Obviously the fight was greatly influenced by Juan Manuel Marquez because we understand that Latinos have a strong base in the United States and they buy the fights. Mayweather and Marquez met in 2009, another return fight for Mayweather. That fight generated just over 1 million PPV buys. Does this actually mean anything? Probably a chance for Bob Arum to gloat, not much else. Maybe a bit more leverage in the negotiations regarding the split of cash. It’ll be so much that it shouldn’t really matter, but there are a lot of greedy people sitting around those tables, if they’re actually doing any kind of talking. When you get down to it, it’s just a small win for Manny Pacquiao fans, even if he needed a lot of Mexican Marquez fans to help.